These piglike creatures are characterized by presence of four-hoofed toes on the front feet, but only three on the hind feet (outer dewclaw absent); short, piglike snout; crushing molars; nearly straight and daggerlike canines (tusks); harsh pelage with distinct "mane" from crown to rump; distinct musk gland on rump; two pairs of mammae, inguinal in position; distinct whitish collar across shoulder in adults, rest of upperparts grizzled black and grayish, with dark dorsal stripe; young reddish to yellowish brown, with black stripe down back. External measurements average: total length, 870-1,016 mm; tail, 12 mm; hind foot, 210 mm; height at shoulder, 816 mm. Dental formula: I 2/3, C 1/1, Pm 3/3, M 3/3 X 2 = 38. Weight, 13-25 kg. Formerly north to the Red River and east at least to the Brazos River Valley. Now restricted to western Texas and the brush country south of San Antonio. In Texas, collared peccaries (often called "javelinas") occupy the brushy semidesert where prickly pear is a conspicuous part of the flora. They are commonly found in dense thickets of prickly pear, chaparral, scrub oak, or guajillo; also in rocky canyons where caverns and hollows afford protection and in barren wastelands. 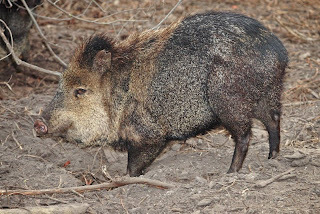 Peccaries are active mainly in early morning and late afternoon and often bed down in dense brush or prickly pear thickets during the heat of midday. They travel in bands ranging from a few animals to several dozen and have a rather limited home range. In the brush country of South Texas, for example, marked individuals moved within home ranges varying in size from 73 to 225 ha. Home ranges of adjacent peccary herds may overlap slightly, but usually only one herd at a time is found in this "border." The boundaries of the home range are marked by scent emitted from the conspicuous musk gland on the animal’s rump, which also serves the individual in keeping contact within the herd. Legendary tales of the peccary have caused inexperienced hunters to kill them through fear rather than for either sport or food. 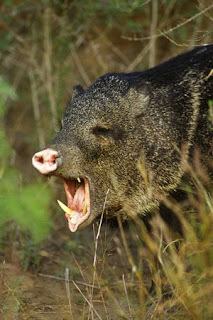 Through exaggerated tales of the peccary’s ferociousness, it has been charged that peccaries will kill or injure dogs and that they are a menace to deer hunters in the dense brush. It is true that encounters between peccaries and untrained dogs usually end with dead or crippled dogs, but it is also true that in these battles the dog is always the aggressor, and any animal will defend its life to the best of its ability when attacked. 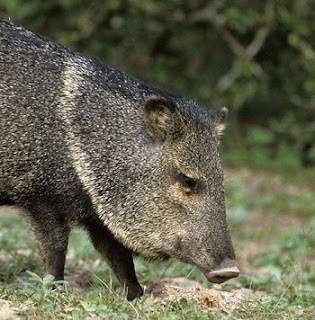 The peccary is absolutely harmless to the range, to livestock, and to people. 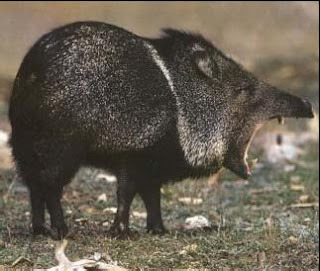 Peccaries are chiefly herbivorous and feed on various cacti, especially prickly pear, mesquite beans, sotol, lechuguilla, and other succulent vegetation. In areas where prickly pear is abundant, peccaries seldom frequent water holes because these plants provide both food and water. Contrary to the habits of the common pig, peccaries rarely root in the ground b ut rather, push around on the surface — even where the soil is very sandy and loose — turning up chunks of wood and cactus. Mast, fruits, and terrestrial insects also are eaten. The collared peccary is the only wild ungulate of the western hemisphere with a year-round breeding season. The number of young is usually two, but litters range in size from one to five. 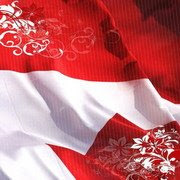 The gestation period is 142-149 days (5 months). At birth the young are reddish or yellowish in color and weigh about 500 g. They are able to follow the mother within a few days, at which time the family joins with the rest of the herd. Young females attain sexual maturity in 33-34 weeks; young males, in 46-47 weeks. 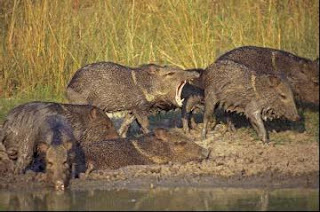 In Texas, the peccary was hunted commercially for its hide until 1939 when it was given the status of a game animal. Perhaps a far greater value is in its relationship to range vegetation as peccaries are able to control (by eating) certain undesirable cacti present on overstocked rangeland. 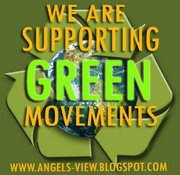 I would appreciate if a staff member here at angels-view.blogspot.com could post it.